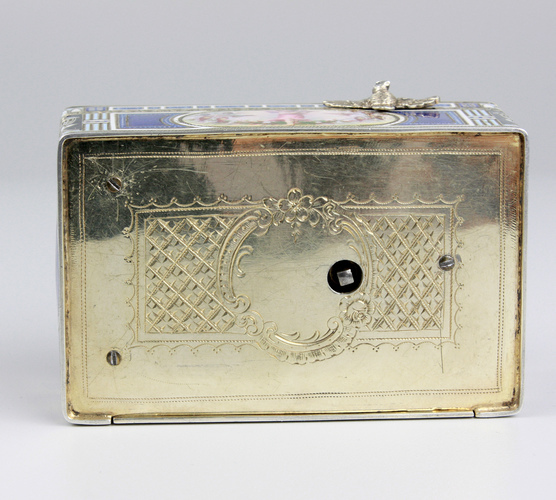 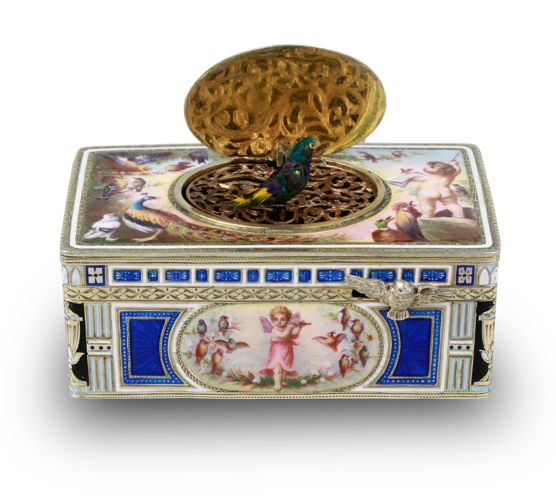 When wound and the start/stop pull actuated, the bird lid opens whilst the bird rises quickly through the finely tooled and pierced gilt grille, moving polished gilt beak, wings, tailfeather and moving body from side-to-side through full 180-degrees to continuous birdsong. 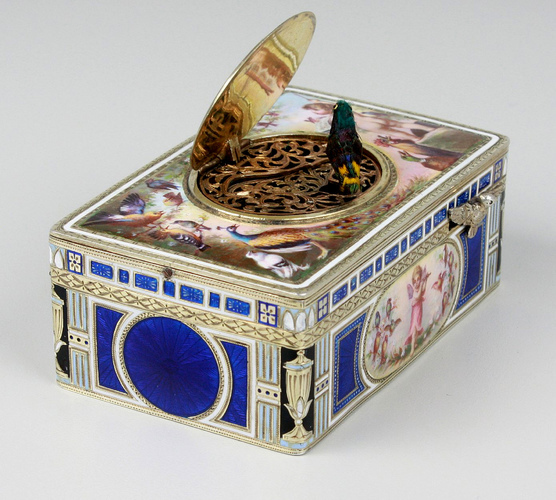 The bird with jade green, grass green and lagoon blue feathered plumage, twist of yellow to the tailfeather, reflected in full to highly polished silver gilt lid interior, gilt grille with chased leaf and scroll detail, the case in typical No. 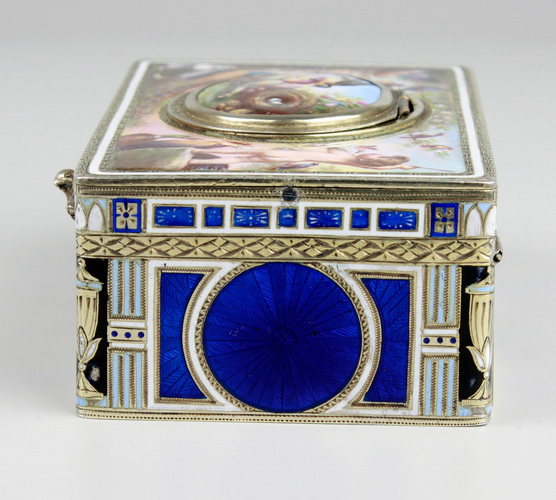 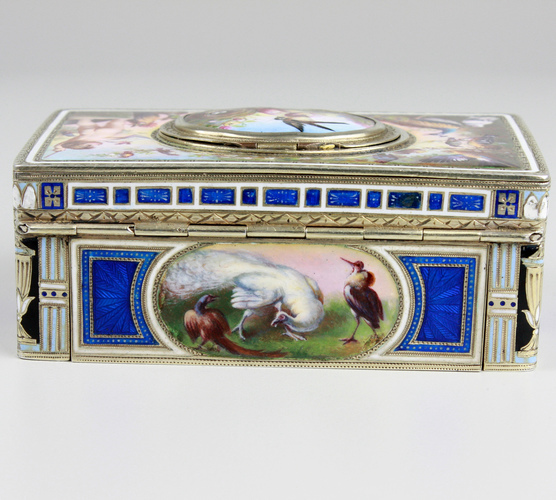 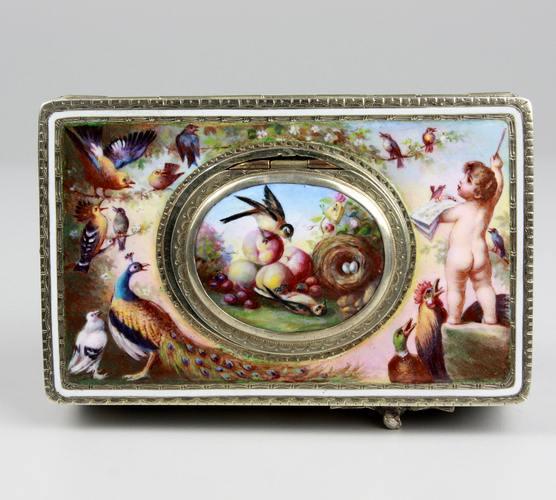 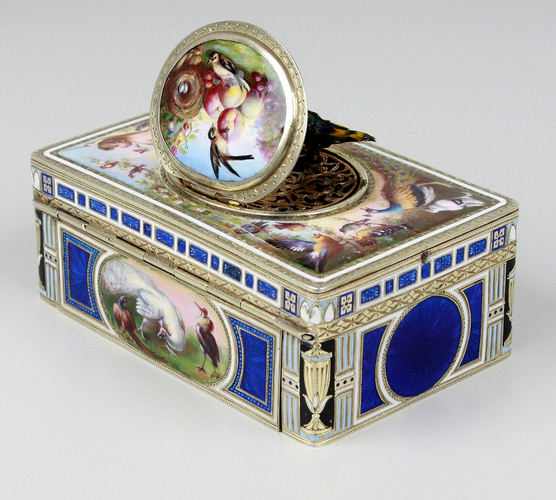 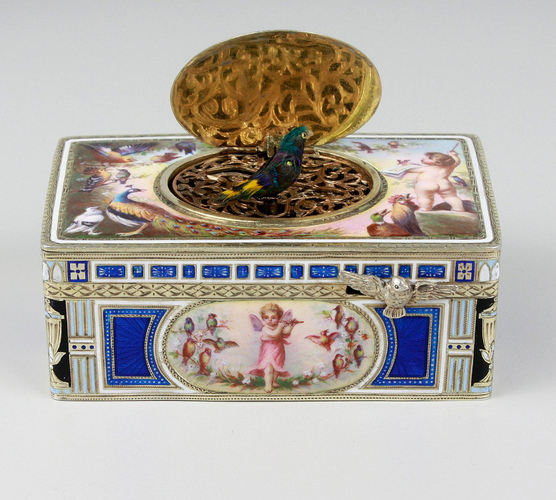 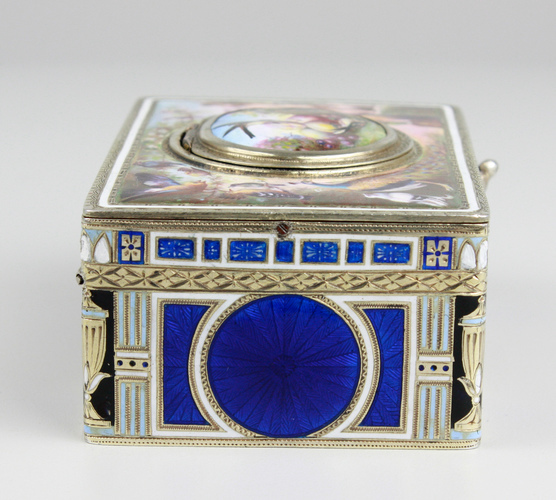 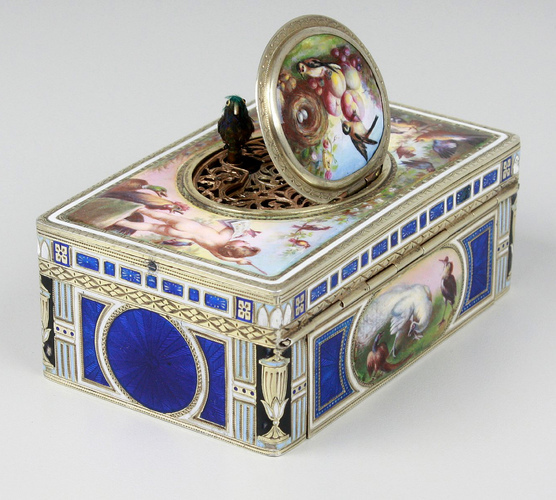 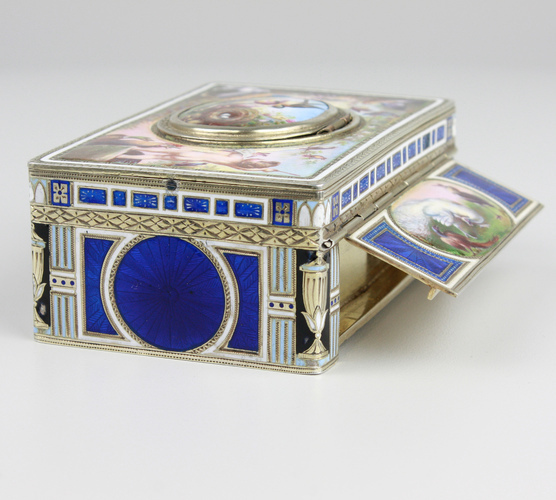 7 glorious enamel coverage to incorporate full pictorial scene to the lid with bird lid having central view of birds at the nest surrounded my many exotic birds including a peacock, all superbly executed in the highest band of quality for this special model, the corners with the capital heads, fluted detail in light blue and white, edge band in electric blue repeated to all sides, the front with oval painted study of an angell playing the flute surrounded by songbirds, verso with a scene of three birds including a white peacock, framed by white enamel, intermediate ground with engine turned blue, the sides with similar finish and with simplistic oval quatrefoil centres, underside with tooled framing decoration, the whole silver case tooled throughout complimenting the enamels beautifully.